WASHINGTON — The ads for getting your college student ready to go off to school are now in full swing, touting everything they will need to outfit their dorm rooms and apartments, from mini-fridges to computers. Parents and students will start to access college 529 funds they have saved specifically to pay for many of these college expenses. The question that comes up time and again when we meet with clients is what expenses those 529 accounts will cover. It’s a great question, and one to ask before you start withdrawing from your 529 savings, since not all college expenses are considered qualified expenses. Because 529 accounts are tax favorable, they have strict rules on what the money can be used for, when the withdrawals must be used and what happens if you take out too much. These funds can also affect a student’s financial aid, so it’s a good idea to get the facts first to avoid any unforeseen problems. As long as 529 plan withdrawals are used for “qualified higher education expenses” (QHEE) during the year in which they are withdrawn, account earnings are tax-free. If money from a 529 plan is used for anything that does not meet the “qualified expense” criteria, the earnings portion of that non-qualified distribution will be taxed as ordinary income and subject to a 10 percent penalty. Exceptions to the 10 percent penalty rule pertain to a beneficiary who becomes disabled, attends a U.S. Military Academy or gets a scholarship. The principal portion of any withdrawals, which is made up of your after-tax contributions, will never be taxed or penalized. What is a 529 Qualified Higher Education Expense (QHEE)? Students must be a full-time or at least part-time student enrolled at an accredited institution. 529 plans can be used to pay for two and four year colleges, vocational and technical schools, graduate school programs and some international schools as long as they are an eligible 529 institution based on their Federal School Code. The list of QHEEs is not long, and you should not have a problem if you stick to the list below. 2. Room and board: On-campus dormitory room and board is a qualified expense. Off-campus housing and meal costs are eligible up to the college’s published allowances in their “cost of attendance” figures. Caution: 529 Funds used to pay for rent or meals in excess of the allowances published by the college’s annual cost of attendance (typically found online from the admissions or financial aid office) are not qualified expenses. If the student’s expenses are higher than the allowable amount, the difference must be paid from funds that do not come from the 529 account. 3. Fees: All fees, such as administration, lab and technology fees required by the school, are an eligible expense. 4. Books and supplies: So long as they are required, these are qualified expenses. Supplies such as pens, paper, printer ink and any books or supplies required by specific classes are also qualified expenses. Caution: The school will set the budget for books and supplies, so check with them for the allowed amount. 5. Technology: Computers, software, printers, internet services and other programs required by specific classes are qualified expenses. Caution: These expenses count as long as they are purchased during the time your child is enrolled in college and used for educational purposes. 6. Additional expenses of special needs beneficiaries: These include certain services and equipment that a special needs student would require, such as wheelchairs and transportation costs, which are generally considered a non-qualified expense. Caution: It’s a good idea to check with your accountant or financial advisor before contributing to a 529 account for a special needs child because the benefits they receive from the government, such as Supplemental Security Income, restrict the income and assets owned by the beneficiary to qualify. While outfitting that college dorm can be expensive, it doesn’t count as a qualified expense. Here are other expenses that you should not consider in your 529 withdrawal as they won’t count either. 1. Transportation costs: Costs for airfare, gas and auto expenses. 2. Insurance: Health and life insurance are not qualified, even if they are offered by the university. 3. Student loan repayment: If a student has college debt, they can’t use their 529 savings to pay it down. Instead, use as much of the 529 savings to pay for college expenses up front to avoid having to take out unnecessary loans. 4. Cell phones and other electronics: While some electronics such as computers and printers are eligible expenses, these must be purchased and used while a student is in college. Cell phones, cell phone plans and electronics for personal use are not eligible. 5. Club and activity fees, including fraternity and sorority membership dues: These are considered extracurricular and are not eligible. 6. Lifestyle and personal expenses: Mini refrigerators, laundry and personal expenses are not eligible. Since 529s can affect the financial aid a student receives, it’s important to coordinate these 529 plans to maximize their financial aid benefits. 529 plans owned by a student or parent receive favorable treatment on the Free Application for Federal Student Aid (FASFA), which is used to calculate a student’s Expected Family Contribution (EFC) in determining how much federal student aid the student may be eligible to receive. The value of a 529 plan owned by a dependent student or parent is considered a parental asset on the FASFA and will reduce the student’s aid package by a maximum of 5.64 percent of the asset value. So if a parent has a 529 account worth $50,000, their child’s potential financial aid award would be reduced by $2,820 (i.e. 5.65 percent x $50,000). In comparison, a custodian account under UGMA/UTMA will be counted as a student asset and reduce the aid package by 20 percent of its value. In the case of a $50,000 UTMA account, this would result in a potential $10,000 student aid reduction which is significantly less beneficial. 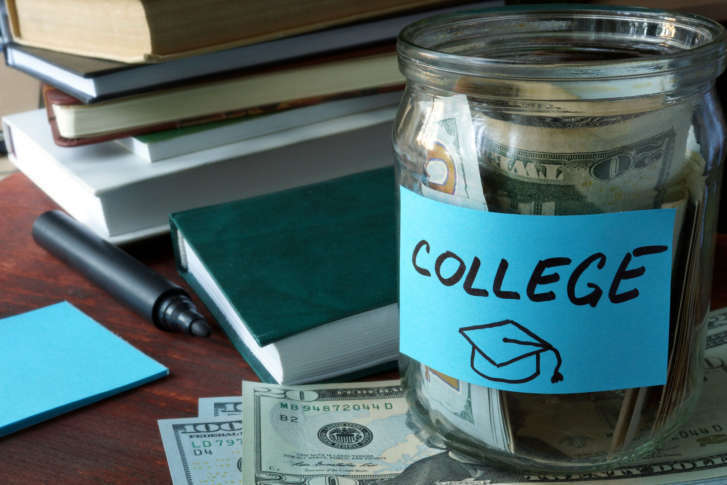 Plan ahead if there is more than one 529 account for a student applying for financial aid, particularly if the 529 account is owned by a grandparent or other relative: It’s not uncommon for grandparents or other relatives to fund 529 accounts. Withdrawals from these third party 529s will be treated as income to the student on the FAFSA in a future year and can reduce the financial aid amount by 50 percent of the 529 withdrawal. It may be advisable to wait to use these third party 529 accounts for a later year of college (when a student no longer needs to file annual FAFSA) or graduate school. Learn more about how 529s affect financial aid. If your child receives a scholarship, you basically have three options for your 529 plan: (1) use the 529 plan for qualified expenses not covered by the scholarship, including graduate school in the future; (2) direct the 529 to another family member-beneficiary such as a sibling; or (3) withdraw the like-amount of the tax-free scholarship from the 529 plan, penalty-free, and pay income tax on any earnings. Timing is everything: The 529 withdrawal must be used to pay for QHEEs in the same year so you need to make sure to match same year withdrawals with expenses. Be careful not to pay tuition in January with 529 money that was drawn in December of the previous year. You can ensure proper matching by requesting that the distribution from your 529 plan be sent directly to the school bursar. If you take too much money: It’s not uncommon to take a 529 distribution only to discover that your student doesn’t have enough qualified education expenses this year. There are two options: prepay next year’s expenses, or roll over the excess into another 529 account if you catch it within 60 days of withdrawing the funds. Keep in mind that rollovers are limited to one every 12 months. Avoid tax surprises: The burden of proof for tax purposes is on the 529 owner so it’s best to keep copies of all college payment statements and support in case you get audited. Ask for help: As you tap into your 529 accounts, don’t be afraid to ask for advice from your financial advisor or CPA if you want to be sure about the best way to withdraw and apply these funds. Speaking of college, there is one more very important thing you should do before sending your young adult off to college — have them sign some important legal documents such as a Health Care Proxy and HIPAA Authorization that will allow you to act on their behalf in case of emergency. Read Essential documents your young adult children should sign to learn more. Nina Mitchell is a Senior Wealth Advisor and co-founder of Her Wealth.